Until summer 2014, the family vehicle was a 1996 Ford Taurus hatchback in the 13th round of a 12th round boxing match with the US highway system. My mom’s philosophy was to never, and I mean never, walk into a dealership when desperate. Emotional buying leads to impulsive purchases. So, we actually started looking for a new car as early as January 2013. At that stage, my mom’s search was really vague. Her famous line was “a car is four wheels that gets you from point A to B”. At the beginning of our car hunt, I liked cars in a detached sense but I wasn’t nearly as versed in their vocabulary and models as I am now. Throughout the course of our car search, I fell in love with cars of every make and model. Even as I grew more comfortable with the vernacular of car dealerships, it was still a stressful and difficult experience until the second we put the keys into the car we actually purchased -- about one and a half years after the day we first walked onto a lot. We ended up getting a 2013 Mazda 6 in the summer of 2014. Even as late as 2014, electric vehicles and hybrids were not as common or popular as they have grown to be today. Yet, electrics and hybrids can still be more expensive than your average sedan/small SUV; as such, the question most people ask themselves on the lot is: is the higher price of an electric/hybrid vehicle worth the higher initial price? (or MSRP). This guide is aimed at helping to answer some of those questions by comparing the 5 Year Cost to Own of popular gas-powered cars with premier electric and hybrid models. 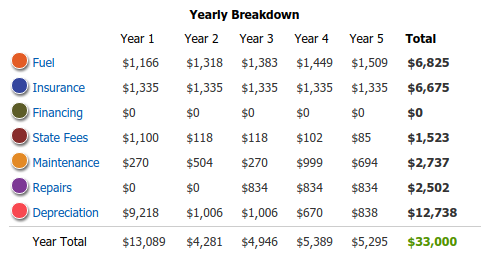 I have taken all 5 Year Cost to Own data from Kelley Blue Book's tool on their website. We are going to compare popular car models on the basis of their initial MSRP off the lot and how much it costs to own them for a five year period, once you include costs like maintenance, fuel/electricity, repairs, and depreciation. According to Kelley Blue Book, fuel accounts for up to 26% (over 1/4) of out-of-pocket expenses for car owners in a five year period. On that note, let's investigate the savings of cars that fun on less or no gas! How is Fuel Cost Estimated? Kelley Blue Book estimates 5 Year Fuel Cost "based on 15,000 miles per year (or the customized mileage you provided) and reflecting 45% highway driving and 55% city driving". 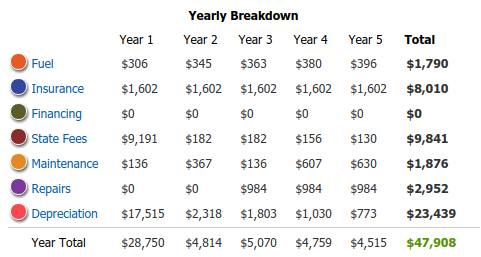 * Data based off of the Camry LE - the lowest priced style, All data courtesy of KBB 5 Year Cost to Own Tool, Costs DO NOT include projected interest from financing, as there is no reliable way for me to estimate your APR or down payment. 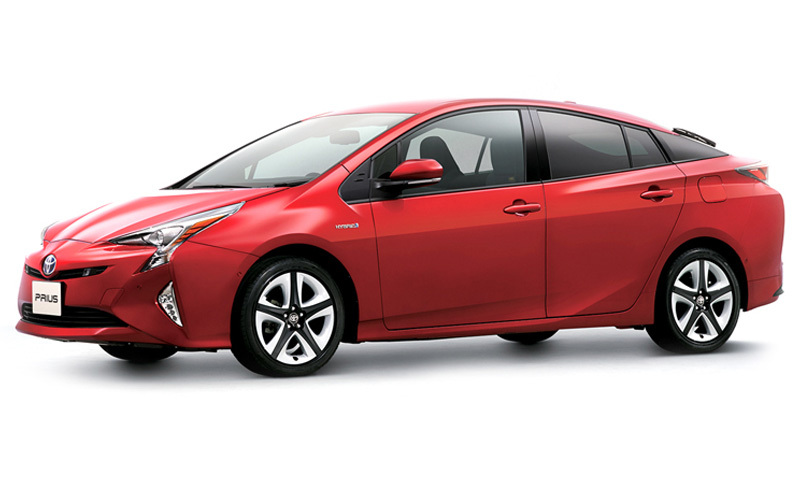 * Data based off of the Prius Two - the lowest priced style, All data courtesy of KBB 5 Year Cost to Own Tool, Costs DO NOT include projected interest from financing, as there is no reliable way for me to estimate your APR or down payment. 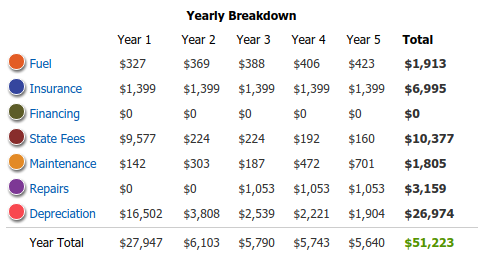 * Data based off of the Focus Sedan S - the lowest priced style, All data courtesy of KBB 5 Year Cost to Own Tool, Costs DO NOT include projected interest from financing, as there is no reliable way for me to estimate your APR or down payment. 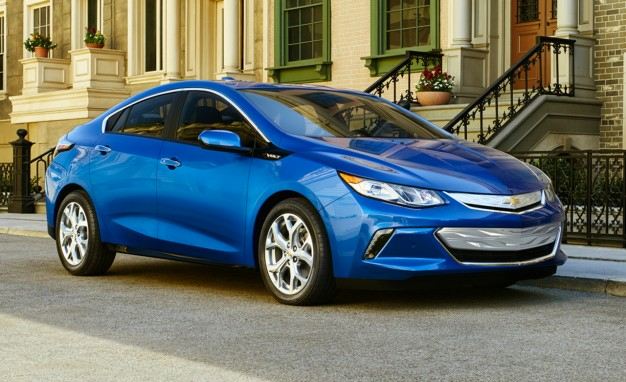 * Data based off of the Volt LT - the lowest priced style, All data courtesy of KBB 5 Year Cost to Own Tool, Costs DO NOT include projected interest from financing, as there is no reliable way for me to estimate your APR or down payment. To be honest, I was not expecting the electric and hybrid vehicles considered here to have such a high 5 year cost. It is a well known and accepted fact that hybrids and electric vehicles are more expensive off the lot than their gas-fueled counterparts of similar size, but the 5 year cost to own seriously shocked me. With that said, the highest single cost on the electric and hybrid cars was depreciation. That makes sense, as the MSRP of Evs and hybrids is inflated by manufacturers right now. Additionally, since all EV and most hybrid cars are so new to market, it is really hard to find pre-owned models, forcing you to purchase a new model... and any new car is going to have significant depreciation the second you drive it off the lot. You also have to consider that if you keep your car longer than a five year period, the fuel savings amplify further as there is less depreciation and other costs in year 6+. However, once you get around year 10+, you're going to be facing increased maintenance costs, so the "fuel savings are more in later years" statement is kind of a double-edged sword. If you have more questions about electric vehicles vs traditional gas fueled cars, feel free to ask questions in the comments section. Also, I found this AMAZING Consumer Reports article with a wealth of information on "Electric Cars 101".